Steve Rice (Olympia, United States) on 17 December 2012 in Documentary & Street. Avec le drapeau quelle vue sur ces belle motos, sueprbe. Excellent framing with the flag in the foreground. I love the color treatment that brings old side, I like a lot. Good approach to this shot, it really attempts to show the whole story in one picture. A marvelous capture and beautifuly done. Your title really sums up the feeling this carries . . puts the imagination firmly in gear. I was thinking that it must have been really loud! @Julie L. Brown: You're right. It was pretty loud. Nice shot of these bikes arriving, Steve. Beautiful composition and superb colors ! Il pleut mais l'ambiance et les belles machines sont là !!! superbe traitement. Cool series, but very strange tones of processing ! Great POV chosen for creating this excellent composition. Beautiful warm tonality. cool! - how did you keep your camera dry? @PD: Well, I didn't actually. But, it was a light rain. A fine job of composing in these difficult conditions. Fine detail and color. Very good job of selecting among all the cycles. Einfach eine sehr gute Aufnahme. It really is nice to see so many people come together and make it a success...Brilliant capture! I also like the flag and your focus. 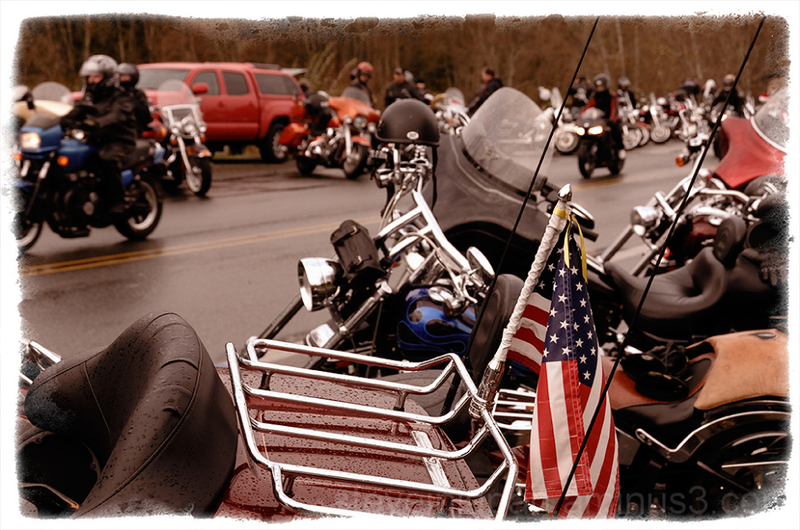 A beautiful concentration of bikers even in the rain ! I love the patriotism conveyed in your shot. Love the focus on the flag. This is a fun shot, great framing! Expectacular despliegue de behiculos...Excelente color y luz...Saludos. Great gathering and street scene; even in the wet weather! Awesome shot! Beautifully-rich colors captured on this overcast, rainy day! Your title really emphasizes the line of motorcycles not seen within the frame here. Great depth. Looks like a fun day. There's a Toy Run held here in Regina annually too! Wonderful opportunity to give to those less fortunate! there sure are a lot of 'em, nice shot!